In 1850, three men banded together and started a company that would later be known as the Waltham Watch Company. These men were David Davis, Edward Howard, and Aaron Lufkin Dennison. 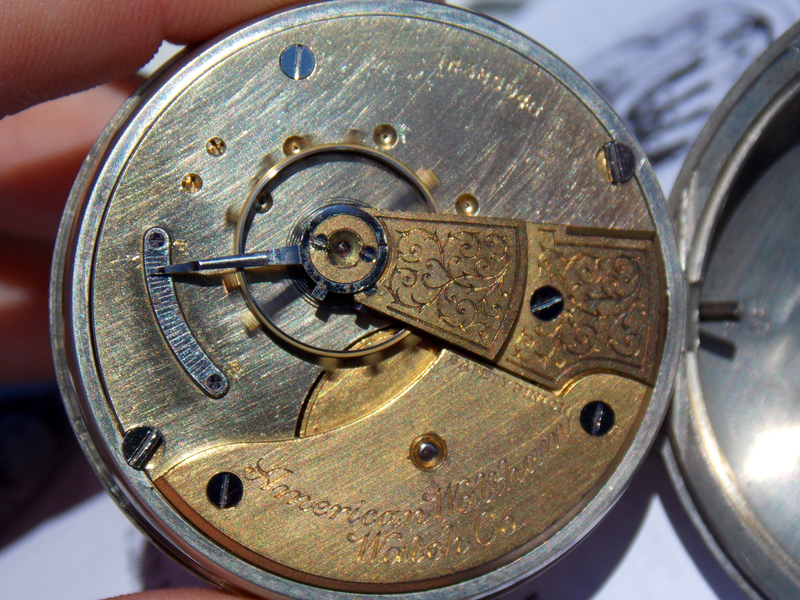 Their revolutionary vision to manufacture fully interchangeable precision watch movement parts would eventually be perfected and patented by Howard and Dennison. 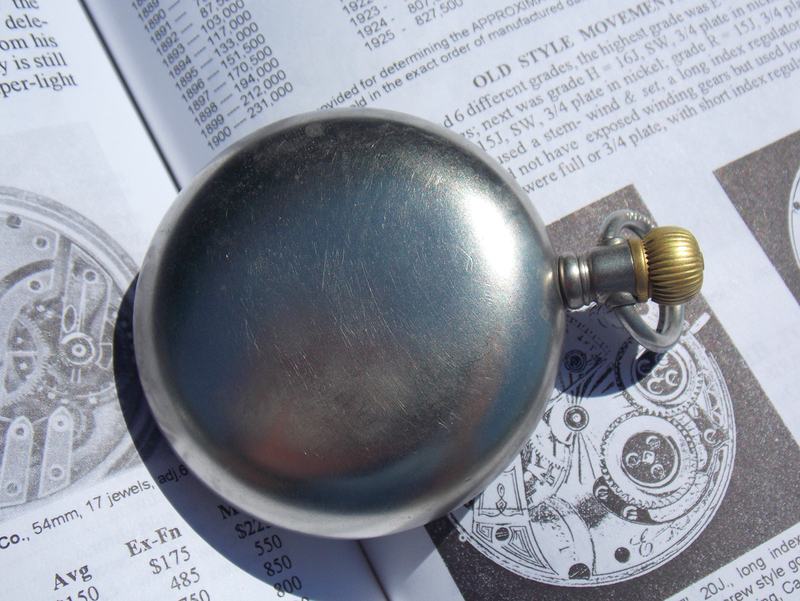 Pocket watches hold with them a sense of nostalgia. There’s something about sitting down to breakfast and winding a mechanical watch each day. Taking out a handmade precision piece of machinery and contemplating the days it’s seen. I have wanted to purchase an antique pocket watch for sometime now. 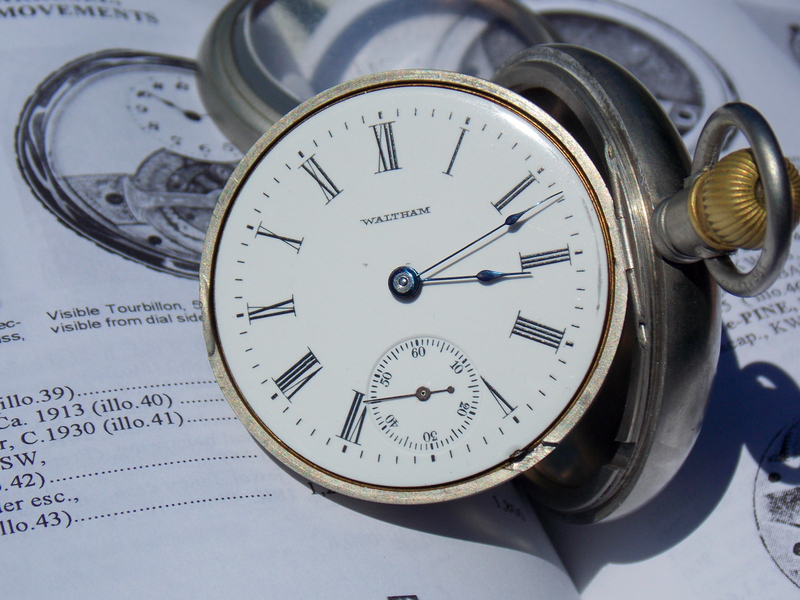 In fact I had recently gone to a high end jeweler and discovered an 1890’s Waltham hunting style pocket watch for sale. The watch did not run and came with a $200 price tag along with a $130 repair bill to get the watch “functioning.” This was a bit beyond my price range for a first pocket watch purchase. Last week, I entered a local antique store and to my surprise I discovered an open face side-winding Waltham pocket watch sitting in a display case. The watch was worn but upon holding it and winding the crown I discovered that the watch was functional. The only visible issue with the watch was a missing sub second hand. For $65 I was confident that I had found the perfect first pocket watch. I ended up purchasing the watch and took it to the same high end jeweler I had previously visited. While there, I had the opportunity to meet with the onsite watchmaker. After having a lengthy conversation, he was impressed with my desire to maintain the watch’s historical integrity and offered to service it at no charge. In purchasing and servicing this vintage Waltham I have joined a distinguished league of Waltham owners. One such owner includes former President Abraham Lincoln. President Lincoln owned and carried a William Ellery (key wind watch) Waltham Model 1857 (serial number 67613). The watch is currently on display in the National Museum of American History at the Smithsonian Institution in Washington, DC. Another distinguished Waltham owner is Astronaut David Scott. Scott lunar-tested his Waltham brand Swiss Made wristwatch in 1971 during the third EVA (Extravehicular Activity) of the Apollo 15 Mission. Scott wore the Waltham when he noticed that the crystal to his NASA standard issued Omega Speedmaster Professional chronograph had “popped” off during the previous lunar EVA. 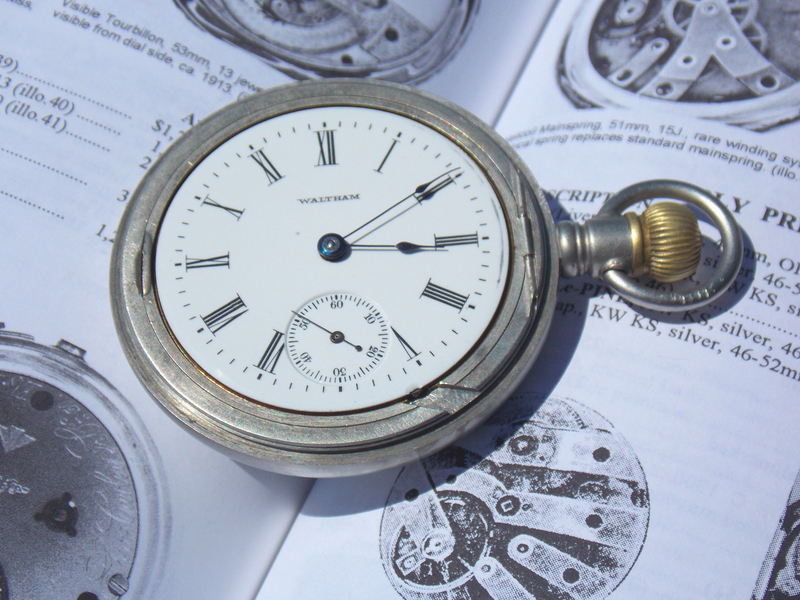 This freshly serviced vintage Waltham model 1883 pocket watch is running well and keeping fairly good time for being 108 years old (+18 seconds per 24 hours). The serial number (14385946) dates this open-faced, size 18, 7 jeweled, unadjusted, full plate pocket watch to the beginning of 1905. The watch is a lever set, stem-wind (sidewinder watch-3 o’clock stem/crown position), with a bronze crown that is in good condition. The Roman Numeral, white, single-sunk dial reads: WALTHAM and shows no hairline cracks or chips in the enamel. The blued steel “Spade Style” hands as well as a replaced sub-second hand are in very good condition. The beveled glass crystal has no chips or cracks but shows a few light scratches. For $65 I am confident that I found quite a bargain for a watch that was certainly used and cherished by a member of a distinguished league of gentleman. This entry was posted in Vintage, Watches and tagged Abraham Lincoln's watch, Astronaut David Scott, Pocket Watch, Vintage Watch, Waltham Watches. Bookmark the permalink. 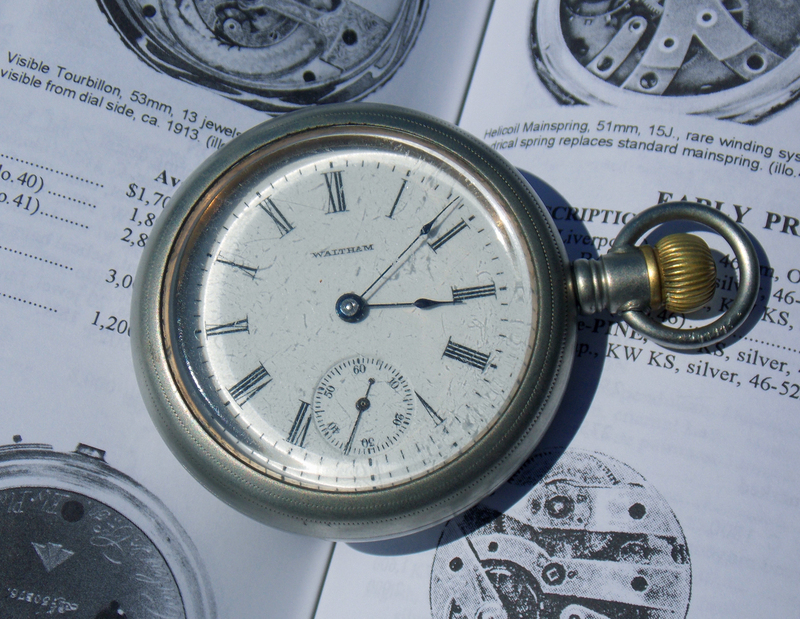 There are many factors to consider when determining the value of an antique time piece. 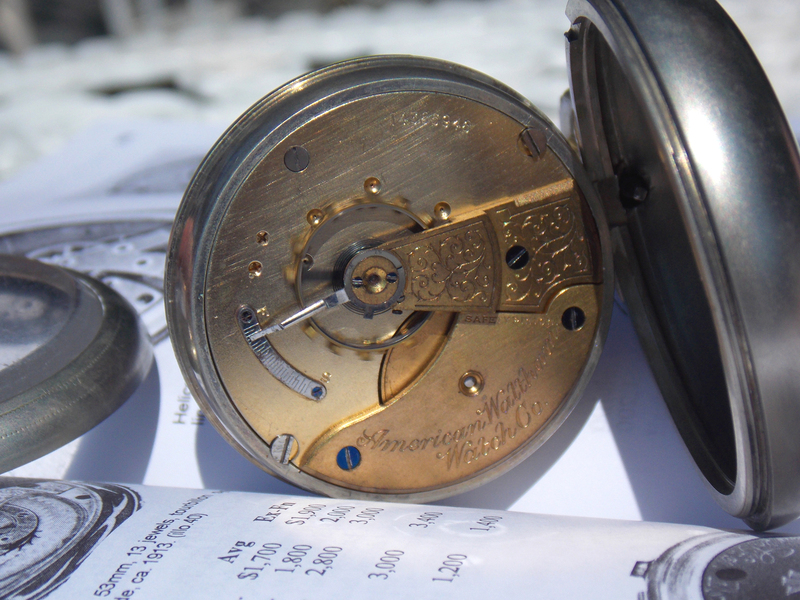 I would contact a certified horologist to give you an accurate appraisal of your vintage timepiece. My grandmother has a Waltham “Bostonian” pocket watch that is in a blue box, and in the top part of blue box it has a card insert with the price of $45 and a discription of the Waltham Co. The watch itself is gold and oddly shaped. I’ve searched on several Web sites, but can’t find not one pic or anything on this particular pocket watch. I am curious on year made, history and value. If the serial number is legible on the movement you can search that through the Waltham Co. and locate a date range for production. As far as history I know many watchmakers would leave notes in the back of the case on services performed and dates of cleanings. 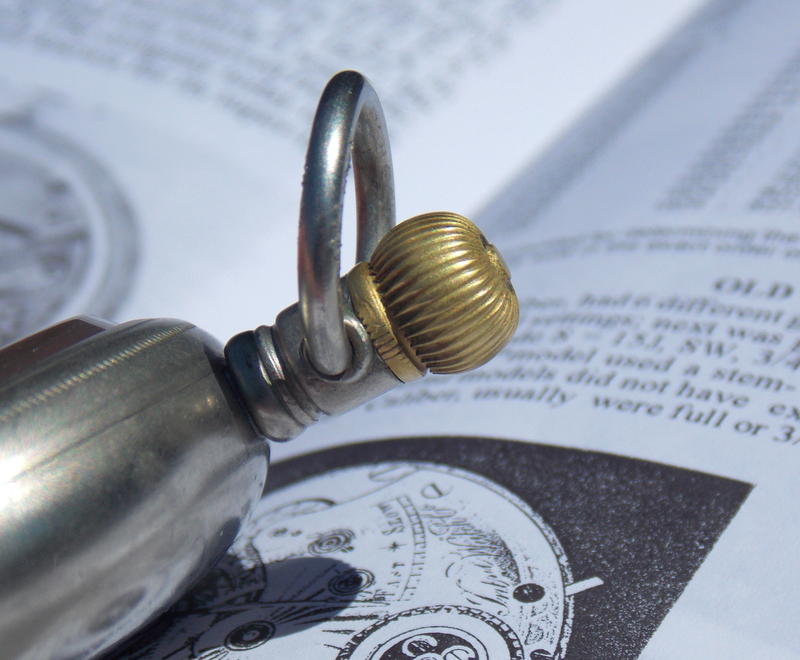 For value a certified horologist would be your best bet. Hello, great watch and great article! I live in Bucharest, Romania, and, believe it or not, classic American watches like Waltham, Elgin, Hamilton or Illinois are not rare here. I’m fascinated by mechanical watches since childhood and I have a modest, but interesting collection, made from well choosed pieces. I have Swiss, French, German, British and Russian watches. (Russians made very good watches, as good as Swiss ones.) My oldest watch is a British Farringdon, from 1878. But I never had an American watch, before. I’m very pleased with it. But I have a question, if you don’t mind: to set the hands at the right hour, I do like on an ordinary mechanical watch, by pulling the crown and rotating it (in what direction? it’s counterindicated to rotate the hands otherwise than in the run way), than push it on its initial place? I’m sure that’s the right way to do, but, how I never had a 19th century American watch before, I better ask. I don’t want to damage something. Many vintage watches are not crown set but rather lever set. When pulling the crown out from the timepiece it disengages the stem from the watch movement allowing you to swing the movement out from the watch case. With my vintage Waltham I have to unscrew the front bezel and then release a lever on the right side of the movement to engage the time setting function. This allows me to then set the watch using the crown in a clockwise motion. That’s very interesting, I would never guessed. That’s the proof it’s always better to ask, before trying. Thank you very much for your answer!